With panoramic sea and Kalkan views the Olive Garden is situated in the perfect location just behind the Patara Prince Hotel. Classed as a villa at Patara Prince Resort, this property is full of charm and character with stone walls set into the landscape. Offering hot and cold air conditioning, wet room, private high speed WiFi and a fully equipped kitchen with a washing machine, kettle, microwave and toaster the Olive Garden has everything you need for the perfect holiday. Thank you for considering my property for your holiday, I know choosing the ideal property to stay at is so important so I hope the details below give you as much information as you need. is a charming 2 bedroom villa that sleeps 4, set in the beautiful resort of Patara Prince, Kalkan. The villa is set in an ideal, secluded location within the resort, but is still only a two minute walk from the Patara Prince hotel and a 5 minute walk down some steps to the two pools overlooking the blue flag awarded sea. The villa is in a fantastic position surrounded by olive trees and stunning pink bougainvillea. It has everything you need for a relaxing holiday in the picturesque resort of Kalkan and was fully refurbished. Inside, the villa has traditional stone walls and marble floors that keep the rooms lovely and cool during the hot summer months. Hot and cold air conditioning is available in both bedrooms if needed. It has a fully equipped kitchen and a lovely lounge area where you can sit and look out to sea. There is a large terrace outside with a covered roof which has stunning views towards sea and Kalkan beyond, perfect for relaxing with a glass of wine. is a recent addition due to the popularity of The Olive Garden and is located at the top of the Patara Prince Resort close to the infinity pool and mini market. Again fully refurbished to offer everything you could require for your holiday the property has a light and airy double bedroom, a mood lit wetroom and very comfortable living space with a sofa bed. There is also a full kitchen and breakfast bar with a washing machine, microwave, kettle, toaster etc. is a simply unique and stunning location within Kalkan, architecturally designed by Turhan Kaso the resort has lush gardens, breathtaking sea views, tennis courts, four swimming pools, direct access to Blue Flag sea waters, an on site spa and bar and restaurant facilities. Not to mention the shuttle bus to take you around the resort, shuttle boat to Kalkan and the 24hr security giving you the perfect escape to relax and unwind. have everything you need for a comfortable stay and are appointed to a high standard, include private high speed WiFi and safety deposit boxes. for those that do not know is one of the most romantic locations in Turkey and I look forward to helping you discover Kalkan and your perfect holiday. Thank you for viewing my property, Im Jon a business transformation consultant from Manchester with a passion for Turkey. When searching for the ideal holiday escape it was essential the property offered stunning sea views, lush gardens, peace and tranquility, yet offering all amenities expected for the perfect holiday. Buying in Patara Prince made was the best decision made as not only does it offer all the above it packages it up into a truly memorable holiday experience. After the fantastic feedback from guests about The Olive Garden I decided to purchase The Cactus Garden in 2016 and fully gutted it to refurbish it to the modern standards expected. Not only does this make a fantastic additional property it also allows those wishing to travel as a larger party of 6 stay in two fantastic properties located in the same resort offering both convenience and privacy. After returning from a holiday we saw The Olive Garden was available for sale and as soon as we saw the views from the terrace we knew we had to buy it! We had never visited Kalkan previously but fell in love with the town, its restaurants and its people. We decided to purchase in Patara Prince as the property offered everything we required; uninterrupted sea views, onsite bars and restaurants, its own water and electricity supply, 24 hour security and direct sea access from the bathing platforms... not to mention the four swimming pools! We also appreciated the peace and tranquillity of the resort and the beautiful gardens and architecture, better still Kalkan centre is only a short taxi ride or a 20 minute walk away. After the lovely feedback we received about The Olive Garden we decided to purchase another property, The Cactus Garden, a one bedroom ground floor apartment at the top of the resort allowing friends and family to visit whilst offering private accommodation. Fully refurbished for the 2016 season we hope you also enjoy the property. 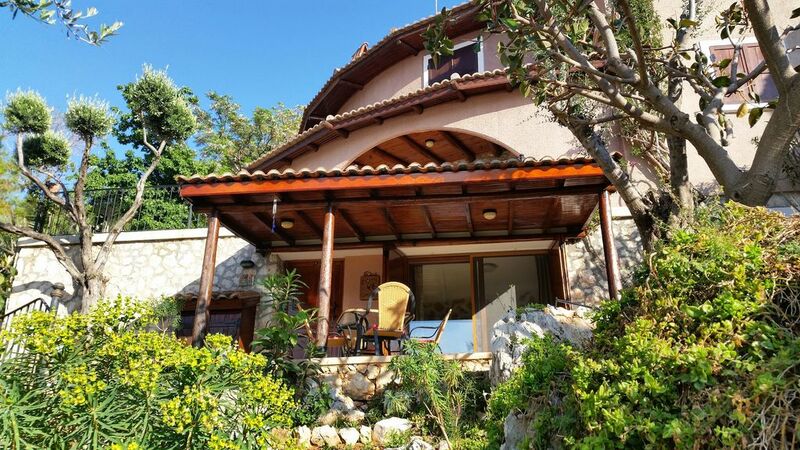 The Olive Garden Villa is situated in an excellent position within the resort, with uninterrupted sea and Kalkan views combined with the convenience of being close to all the main resort facilities. The Agora restaurant and bar is only a 2 minute walk away and the Grand and Adult pools only a 5 minute walk away. The Olive Garden is also situated close to the main hotel building allowing easy access to the resort Shuttle Bus and Spa Facilities. The Cactus Garden is located at the top of the resort by the infinity pool and mini market. For those wishing to avoid steps the garden level apartment is only a couple of steps from the Palm shuttle bus roundabout offering regular journeys to the sea front and grand pools. For your convenience we also have a private fast Wi-Fi internet connection in both properties. Fully refurbished wet room with walk in rainfall shower, travertine tiles, w/c and sink/vanity unit. Provided through air conditioning units in both bedrooms. Free wifi available within the property. Bath and hand towels are provided. Please bring your own beach towels. Light and airy lounge with beautiful views towards the sea and Kalkan town. Pretty stone fireplace and double glazed sliding doors to the outside terrace. Sofa and armchair. Flat screen tv, dvd player, CD player and ipod dock. Refurbished kitchen that is fully equipped. Modern, granite worktops, washing machine, hob, oven, microwave, fridge/freezer, kettle, toaster, crockery, pots and pans. Dining area is located on the terrace with spectacular sea and Kalkan views. Shuttle boat service to Kalkan (local fees apply) and access to water sport facilities provided by Patara Prince Hotel. Offering stunning sea and Kalkan views. Notes on accommodation: The exclusive Patara Prince resort is a gated complex and also has 24 hour security so you can relax knowing that the property and your possessions are safe. All of our guests are given a villa owners card on arrival that entitles you to a 25% discount on all drinks and food at the restaurants and bars in the resort. On your arrival you will be met by our representatives in resort and shown to the villa. Outside: Large private terrace with table and chairs and fantastic views over the bay of Kalkan. There are four shared swimming pools within the resort. The two closest to the villa(5 min walk) are the large main pool and the round pool. The large pool has stunning views over to Kalkan and also a small children's section. The smaller round pool is for adults only and offers a tranquil place to read. There is an infinity pool at the top of the resort and an indoor swimming pool. The resort also has lovely bathing platforms with sunbeds on that have steps into the sea. To get about the resort there is a shuttle bus service that runs daily from the bottom of the complex to the top. This stops just outside the hotel (2 min walk away) from the villa and can you go down to the pool if necessary or up to the infinity pool, supermarket and tennis courts at the top of the resort. There is also a fantastic spa and Turkish bath in the hotel that offers a range of treatments. Cleaning / Towels / Linen / Maid service: Towels and linen provided. Weekly cleaning service and change of linen. Beach towels not provided. Other: Large private terrace with stunning views out to sea. Table and four chairs for eating outside, comfy large chair for relaxing in. Stunning area to enjoy a glass of wine watching the sun go down or enjoy the twinkling lights of Kalkan in the evening. Lovely, relaxing resort.. fantastic views with all amenities available. Very clean and well maintained. We were immediately impressed with the property and the amenities. It was very comfortable and nothing was missing.. home from home! The information provided was a great help.. they had thought of everything and the location perfect. Thank you for choosing to stay with us at The Olive Garden we hope to welcome you back again soon. We had a wonderful holiday staying at the Olive Garden Apartment. Everything was spotlessly clean and we really appreciate the welcome pack of daily essentials such as milk, bread, tea and coffee etc. Would definitely recommend staying at this apartment. You also have the hotel facilities at your disposal. Thank you for choosing the Olive Garden again for your holiday, its lovely to welcome you back as repeat guests and look forward to welcoming you again soon. Have just spent a wonderful 11 days in this comfortable and well equipped villa. Gorgeous views from the villa and from all areas of the resort. Resort beautifully landscaped, staff friendly and helpful, great pools with plenty of loungers. Kalkan a beautiful town with great restaurants. Will definitely be returning. Thank you for choosing to stay with us at The Olive Garden, Im so pleased you enjoyed it and look forward to welcoming you back again soon. What a lovely villa and location. We are already missing watching the boats coming into the harbour at night and in the morning. And are regretting not exploring even more of the little caves and rocky coves along the bay with its gorgeous clear water. The villa apartment was a little home from home, with books and nick backs along with helpful guides. When we arrived we were given plenty water, olives, cheese, honey and home made jam with fresh bread. From beginning to end we were given assistance or information if required such as the arrangement of very comfortable and reliable transport. We wish we were still there and visiting the beaches, turtle spotting and visiting ancient ruins . Thanks for choosing to stay at The Olive Garden, Im pleased you enjoyed all the property and local area have to offer and look forward to welcoming you back in future. great break. first rate place to stay. would definitely return. Thank you for choosing to stay with us at The Olive Garden, I'm glad you enjoyed your stay and look forward to welcoming you back again soon. We stayed for two weeks. The villa was excellent, very clean and had everything you could want for your stay. The resort is stunning, pools are picturesque with great choice for families and couples. The owner left a lovely welcome pack for our first day and this was very welcome. We spent every morning and evening on the wonderful terrace which had such a spectacular view that sometimes it was hard to leave and go exploring or just to the pool! At the end of very hot days the villa was cool and the terrace had a nice breeze. Perfect. We also used the spa in Patara Prince and we were impressed with this too, great Hamman, facial and sports massage, manager Alexendr was so helpful regarding advice on where to go in Kalkan too. We have come away with lovely memories. The owner was also really helpful before, during and after the holiday. Highly recommended. Kalkan is beautiful, plenty of places to eat and shop and just explore. Hi Cath, thank you for choosing to stay with us at The Olive Garden, Im pleased the holiday offered you the much needed relaxation and I look forward to welcoming you again soon. Patara Prince has it's own private access to the sea but does not have a beach. Instead there are steps into the sea from the platforms. The resort has been awarded a blue flag. Kalkan town does have a beach which is a 15 minute walk away or can be reached by the boat that leaves the resort. Further out there is the beautiful Kaputus beach (10 mins by car) or the stunning 18km long Patara beach (20 mins by car). Kalkan is easily accessible thanks to its two major airports. Dalaman Airport is the closest airport to Kalkan with a transfer time of about 1.5 hours. Antalya Airport is a 3 hour transfer. We are happy to arrange airport transfers and rental cars for you at time of booking. Kalkan is a couple of minutes drive away by taxi or car. Taxi's can be booked at the hotel and they will pick you up from reception. A water taxi is also available from Patara Prince in high season to take you to the harbour for a small fee but stops running at 8pm. If you wish to walk into Kalkan this will take approx 20 minutes. There is a small mini market at the top of the resort that can be used for your basic provisions. However on your arrival a welcome pack will be provided with the basic essentials. Kalkan town has a selection of larger supermarkets and a number of pretty shops and boutiques dotted down the pretty cobbled streets selling pottery, jewellery, clothes and a must for the ladies...handbags ! There are also traditional shops selling carpets and other Turkish goods. Every Thursday there is a local market selling fruit, veg, spices clothes and gifts. It is a unique and enjoyable experience not to missed. Cheaper than Asda! There are two restaurants that are open in the Patara Prince resort in high season (one in low season) but for more choice a visit to Kalkan town is a must. There a number of bars in Kalkan ranging from chilled out relaxing bars to enjoy a cocktail, or more livelier bars to dance the night away. There is also a huge choice of restaurants, over 100! These consist of roof top restaurants with views to the sea and mountains,quaint back street restaurants or the stunning harbour side restaurants. The standard of food is very high but there is a number of different cuisines to suit every taste and budget !If you like good food Kalkan is an ideal choice. Kalkan is the ideal location to visit the sites . There are a number of historical sites nearby such as Letoon and Patara and boat trips can be arranged from the harbour on the fabulous gullet boats. There are a number of tour operators in the town and Kalkan also has a regular Dolmus (bus) service to sites and beaches. Changeover Day: We offer a flexible changeover day but this can be dependent on other bookings. Check in time is 4pm and check out time 11am, although again we can can be flexible on this where possible. Notes on prices: If you require accommodation outside of the dates stated please contact us for availability.